There’s no reason to fear for the health of the Ontario housing market in 2015. The momentum that propelled the provincial market through 2014 will continue for most of 2015, and even with looming challenges such as slightly higher interest rates and affordability issues, there’s reason for optimism. We asked Ted Tsiakopoulos, CMHC’s Ontario Regional Economist; Robert Hogue, RBC’s Senior Economist for Economics Research; and Ben Myers, Senior VP, Market Research and Analytics at Fortress Real Developments to share what they see for the year ahead. How will the housing market in 2015 be different than 2014? Ted Tsiakopoulos: The economy will play a more pivotal role in supporting the housing market. After lacklustre growth since the recession, for the first time in over a decade the Ontario economy will grow faster than the rest of the country. The lower dollar and lower energy prices are good for the economy and our largest trading partner, the U.S., is showing signs of strength. With a forecast job growth of 1.9% in 2015, there’ll be a nice pickup. Our models tell us when the job market grows; it impacts the housing market three to six months later, as people feel more confident about buying. It typically has a quicker impact on resale than new construction does. 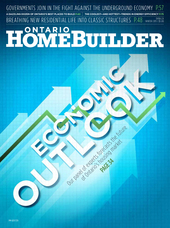 Ontario annual home starts will grow to 63,000 units in 2015, before slowing to 60,400 units in 2016. The picture we saw this year, with the resale market more robust than new housing, will continue into 2015 and 2016. Resale is less expensive and that market will hold up better. The building community has done a good job of channelling demand for new homes towards a build-up of inventory and have cut back on projects. Overall, it’s a stable market, but I think there’ll be more growth in resale. Robert Hogue: It’s going to be interesting. Prices are rising stronger than we expected—a little bit stronger than we like, but we are not in the danger zone. We expect the rate of housing-price increases will moderate. I’m not expecting home prices to decline outright next year in Ontario but to rise at a significantly slower pace by 1.1%. The price increase in 2014 was quite strong at 6%. The market will make us slightly uncomfortable, but I think the market can execute a soft landing. Ben Myers: I’m more bullish going into 2015 than going into 2014. The strength of the 416 area code carried the high-rise market and the 905 was a little slower, with the exception of Milton and Burlington, where it performed very well. If underlying land prices are any indication, affordability in the new housing market will continue to be constrained, and I expect new home prices to continue to appreciate and, with a lack of new supply, resale prices to escalate as well. It (2015) should be a strong year for new starts. How are escalating housing prices and rents impacting the market? Ted Tsiakopoulos: The market is going to respond to higher prices by moving to less expensive housing. We will see continued growth of townhomes and apartments in pricier markets like Toronto and Ottawa. There is room for growth, even with prices going up. Six-storey wood-frame construction will be another way the industry is responding to higher home prices. Building with wood not only lowers costs for builders, but for buyers too. The demand will shift to less expensive housing and part of that equation is rental. The demand for rental demand will grow faster than ownership demand. Some buyers, especially first-timers, are finding it difficult to jump into ownership, so are shifting to rental. We’ve seen some new purpose-built rental come on stream and it has to compete with new condo rentals and is offering similar features. The younger generation doesn’t necessarily see rent-versus-owning as an issue, but a lifestyle opportunity, where they are close to transit, entertainment and can walk to work. Robert Hogue: In the GTA, housing prices have gone up so much that being a renter may become the norm. There are more and more renters and there’s not the same stigma as in the past. It parallels with larger cities in the world, where more people might accept that living in a big city like Toronto means renting and not owning. But what we’ve seen anecdotally is wealth transfers from parents to kids: “I’ll give you a lump sum as a down payment.” I’m not sure of the magnitude, but it’s a recurring theme and I would not dismiss it as a fringe phenomenon. It might become a new way to adjust to the high cost of housing. Ben Myers: The average first-time buyer is 37 years old. It’s different than generations before. Younger people change jobs and move up in the world and don’t want to commit to any one place. But the affordability crunch is affecting them. A lot of them would like to buy, but are not going to ruin their budget; they’d rather spend on nice clothes or going out. Young people will stay in the 416, but those who desire more space will find it more and more difficult. New single detached homes are catering to the wealthy. If homebuyers want something affordable, they are going to have to travel for it. Condos will do well in Toronto, along with mid-rise projects in the 905 region with buyers who can’t afford to get into the low-rise market. How is the shift toward intensification impacting consumers and the housing industry? Ted Tsiakopoulos: We don’t think intensification is strictly policy-driven. The shift towards higher density began long before Places to Grow. The ’70s, ’80s and ’90s were about de-urbanization and suburban living, but by the new millennium we began to see re-urbanization take hold and a real boom in high-density construction. Intensification has stretched beyond the traditional Toronto and Ottawa markets and we’re seeing it in Kitchener-Waterloo, Hamilton, London and Barrie. We see it proliferating to non-traditional communities that were typically single-family communities. We’re seeing more efficient use of land and more choice in the marketplace, and affordability is driving it. Single-home prices have been outpacing condo prices post-recession and we’re seeing single-detached prices grow much faster than apartments. Through the latter part of 2015 and 2016, we will see more condos and towns and the price gap will slow. Robert Hogue: Intensification is here to stay and municipalities are bound (by Places to Grow) to favour building up instead of out. That’s a good part of the reason for the condo boom, especially in the GTA. On top of that, there’s the issue of affordability, and for many, condos are the only option for ownership. The bigger picture in Ontario is that there are infrastructure issues, especially with transit, and it’s clear urban sprawl will be contained as much as possible. Ben Myers: It’s a whole different world, where young people are buying into a neighbourhood as opposed to buying a unit. They are getting used to smaller spaces and are more concerned about being close to amenities, restaurants, bars and whether they can they walk to work since they don’t want cars. Cars are expensive—you have to be concerned about parking and one of the key things is they can’t be connected on their smartphones if they are driving. That’s a big deal. I recently declared that the American dream with the yard and white picket fence is dead—that many buyers want nine-foot ceilings, stainless steel, hardwood and wall-to-ceiling windows, as opposed to a piece of dirt. It’s a fundamental shift and hard for some people to fathom. Will Canada continue to be a destination for international buyers and capital? How has this impacted the market? Ted Tsiakopoulos: It is difficult to determine the impact of international buyers, as there is not a lot of hard data, but we think it’s big. I think we need to make a distinction between a foreign investor and a new immigrant, as there is often confusion about the two categories. New immigrants have been here awhile, they are permanent residents and they have roots. Immigration has accounted for three-quarters of the population growth in Ontario in the past decade. About two-thirds of them typically rent, but after three or four years, they are buying housing. They have a need and appetite for real estate. Real estate is not just perceived as a consumable good; there’s an investment aspect and it has contributed to wealth over the past three decades. Since 9-11, people have naturally gravitated to residential housing as an oasis of stability and this has encouraged more investment. From 2001 to 2012, the average investor’s appetite for risk was quite low and money was flowing into residential real estate. Since 2012, the appetite for risk has been higher and investments in gold and bonds have slowed, as well as investment in rental condos. Does this mean investors will bail? I suggest no—they are there for the long term and will hold for five years or more, since there is more stability in real estate than the stock market. Robert Hogue: This is a phenomenon that has not been measured but relies on anecdotes. I do buy into this storyline of foreign buyers, but they are more an element of the Vancouver market than in the GTA or Ontario. Toronto is a thriving city and a magnet for immigrants and it does attract high-calibre individuals. Population growth is still robust in the GTA and creates a constant demand, and I don’t see an end to the run for Toronto. It will continue to attract investors, and that market is healthy. Ben Myers: Canada is stable politically and on the global stage. Toronto units are still considered affordable and there’s a strong rental market. Many international buyers believe the best place to put their money is into bricks and mortar, and I certainly don’t see it dropping off. Is 2015 the year interest rates start to creep upward? How are these historically low mortgage rates impacting the market and consumers? Ted Tsiakopoulos: We think interest rates will remain low over the next 12 months. By late 2015 and 2016, rates will move gradually higher and respond to the pick-up in the economy. They’ll increase by 50 to 75 basis points but will still be fairly low from a historic perspective. The good news is that almost 70% of mortgages are fixed-rate and if rates creep up, an overwhelming number of mortgage holders will be insulated. For new buyers, we will see more of a shift to less expensive housing. I still think they will stay on the sidelines and we’re not looking at any significant first-time buying activity. Repeat buyers will continue to drive the market. Robert Hogue: We expect interest rates to start rising and we are sticking with that story. When you look at financial markets in terms of U.S. monetary policy, short-term interest rates might start rising, and in Canada we might not be that far behind. We expect bond yields to start moving higher and that will impact fixed mortgage rates. Ben Myers: It will be 12 to 18 months before interest rates go higher. A CMHC investor report found that more than 50% of buyers were taking fixed-rate mortgages, so that takes the worry off their plate if rates increase since they aren’t going to be immediately hit. What do you see as emerging opportunities in the housing market? Ted Tsiakopoulos: One opportunity will be in the renovation market and another is in the rental market. The population is aging and about 80% of seniors want to age in place. Given that cohort is growing by 5% to 10% a year and they will hire contractors to make their homes more user-friendly, it opens opportunities for the renovation market. It is a $24 billion market annually in Ontario, with more growth than in new construction. Echo Boomers who are currently renting or living in their parents’ homes will be entering the ownership market sometime in the next five years. They are not do-it-yourselfers and will hire help. The rental market is another opportunity and is going to be growing faster than ownership in the next year or two. There are not a lot of purpose-built rentals—only about 4,000 to 5,000 completions a year are forecast in Ontario and we are looking in excess of 17,000 to 18,000 new renter households a year. There is a gap here. Condo rentals are filling some of that gap, but we need more purpose-built rentals. There are challenges—you have to find sites, land is costly and there are rent constraints, but I think this is an opportunity. Robert Hogue: There are opportunities across the board, but particularly on the reno side. This is not unique to Toronto or Ontario, but across Canada. In Toronto, we’ll continue to see infilling of the downtown core for another 10 to 20 years. Ben Myers: There are only so many mega-towers we can produce. Those now living in 400-, 500- or 600-square-foot units and who want to stay in the city will be looking for stacked townhouses or mid-rise buildings to move up to in their neighbourhoods. I see opportunities with six-storey wood-frame buildings and a move to that type of product. In the 905, there’ll be opportunities for three-storey detached homes or four-storey townhouses, or perhaps we’ll see something like I’ve seen in the United Kingdom, where townhomes all back onto each other and they have shared backyards.